"No one who anticipates developing a full-service school shouldproceed without first studying this manual." This how-to companion to Joy Dryfoos' Full-Service Schools is thefirst practical and comprehensive guide to establishingschool-based community health and social support services-such aspsychological counseling and drug prevention. Full service (or integrated services) schools have emerged inresponse to the growing needs of children and families and thedwindling of dollars to support them. Based on the trials andtriumphs of an award-winning program, this indispensable guidecontains everything needed to create a full-service (orintegrated-service) school--from planning processes to fundingstrategies to service delivery. It shows schools and communityagencies how to develop workable joint agreements that accommodatea variety of programs and service delivery approaches. Valuableresources include needs assessment forms, intra-agency agreements,program evaluation tools, facilities criteria, funding sources,family service coordination plans, and disk filled with forms andtemplates. Building a Full-Service School has been reviewed andAndorsed by national leaders of the full-service movement. CAROL CALFEE is an administrator and coordinator for a full-service schools initiative in Santa Rosa County, Florida. FRANK WITTWER is Professor Emeritus of Education at the University of West Florida in Pensacola. MIMI MEREDITH is a self-employed writer, editor, and designer of educational, scientific, and community service publications. Why Build a Full-Service School? 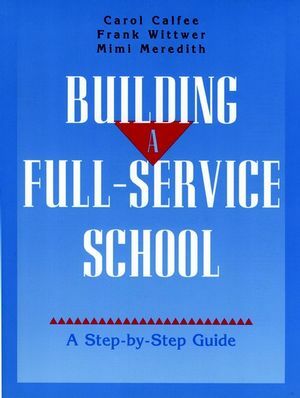 Understanding How Full-ServiceSchools Work. Draw a Blueprint for Collaboration: Planning and Decision Makingwith Stakeholders. Pour a Foundation of Knowledge: Strategies for Assessing CommunityNeeds. Finance the Construction: Identifying Funding Approaches andSources. Frame the Funding Request: Writing Funding Proposals and EvaluationPlans. Furnish the House: Sharing Information, Publicity, andTraining. Appendix A. Matching Full-Service Goals and Services. Appendix B. Job Description: Full-Service Schools ProgramManager. Appendix C. Community Needs Assessment. Appendix E. Full-Service School Facilities. Appendix F. Community Interaction Survey. Appendix I. Characteristics of an Effective Evaluation Plan. Appendix L. Family Services Program Tools. Appendix M. Examples of Training Topics.